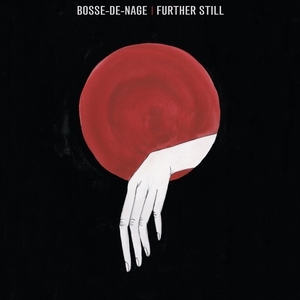 Bosse-de-Nage are the sort of oddball post-black metallers that are notable for a very curious reason; they don’t give that divisive little sphere a bad name. It’s funny in that the less they stand out, the more they end up doing just that, but they seem like those levelheaded arthouse kids in college that weren’t going out of their way to shove their eccentricities and elevated taste buds in your face. Maybe a little bit of that need to flaunt shows up on occasion, like their old tendency to decline interviews and remain within shadow as enigmatic batmans of extreme music, but they’ve largely come back down to earth now. Their fifth full length outing, Further Still, is somewhat symbolic of that sentiment. Their brand of black metal is comprised less of extremes or contrast than of calm, collected blending. There are no grand orchestrated movements a la Deafheaven and none of Lantlos’ calculated virtuosity. Rather, Bosse-de-Nage offer us beautiful chaos. Quite literally. The songs on Further Still aren’t the seven, eight, or ten minute behemoths we’re used to from other post-black metal favorites, instead opting mostly for three to five minute cuts. Nor is there a lot of downtime on the album. Besides the obvious “deep breath moment” in “Dolorous Interlude” (which is hilarious now that I’m acknowledging it) or the few times when clean guitars slip into the mix (see the intro to “My Shroud” or the outro to “A Faraway Place”), the tempo is kept high and the volume kept loud. Guitar riffs are spit rapidfire over the drumwork, which never seems to stop unless everything else does, while a tireless tirade of grunts, snarls, roars and shrieks tumbles overhead. There is a intrinsic sense for melody in the guitar work, but the wild aggression with which they’re constructed brings it into that rare middle ground between post-rock, black metal, and punk, a pure channeling of angsty, extreme energy with melody laced deep in its DNA. The irony of a track like “Listless” is that I don’t think there’s ever a world where a Bosse-de-Nage song is just that. For all that youthful energy, Further Still is somewhat of a disappointment. It’s an album that’s too damn pure and too damn good to ever be described as uninspired, but it’s straightforward. Its predecessor, All Fours, remains Bosse-de-Nage’s crowning effort to date in its vibrant ascension of their core sound paired with the injection of fresh dynamics such as spoken word. Further Still is invigorating and certainly an enjoyable record, but it’s an album that is better at being listened to than it is to be remembered. None of the songs are particularly skippable and there are a few highlights (the last half of “A Faraway Place” comes to mind immediately), but largely you will love it in the moment and struggle to distinguish the rank and file cuts from each other. In hindsight, it’s all in the title. Just as their previous albums were essentially titled Bosse-de-Nage 1-4, Further Still is just four college arthouse kids doing their thing one day at a time. They’re moving forward, but no one’s mind is on winning any races. Me neither lol. Sweet review bro. I think this is pretty much on par with the previous album. the "how to pronounce french" i found on google told me it's closer to Boos deh Najj. I like the riffs and stuff they do here, but by almost totally removing the post-rock I think it makes their style a bit too straightforward to be as memorable, so I agree with you there. Almost there Zaruyache, it's a bit more like "Buhss deuh" in the french canadian way the rest is on point. I don't know what its referring to cause word for word translation is Hump-of-Swim?! Their name is taken from French symbolist Alfred Jarry's book The Exploits and Opinions of Dr. Faustroll, Pataphysician; it is the name of a monkey which may or may not have been a hallucination of the narrator. Should be worth a spin for anyone remotely into the post-black scene, it’s just not as good as they’re capable of. Yeah drumming is def the focal point of this band for me. Deafheaven's album is better, good day to all. It’s not even close lmao. This album felt very one note. I'll give it another chance but I am a bit disappointed.